Wonderful place. Wonderful people. Great prices. Love coming here for our auto needs. When they say best, they mean it! Will definitely keep coming here! Staff is polite and always helpful! Hit a pot hole yesterday and bent the rim. Brought the wheel in and they had me in and out in 10 minutes with no wait for super cheap and all with very cheerful service. 10/10 would go here again. These folks are the best. Super friendly, great price. Needed a used tire put on my truck, in and out in maybe 10 mins. My official new tire shop. Recommend to any and everyone. 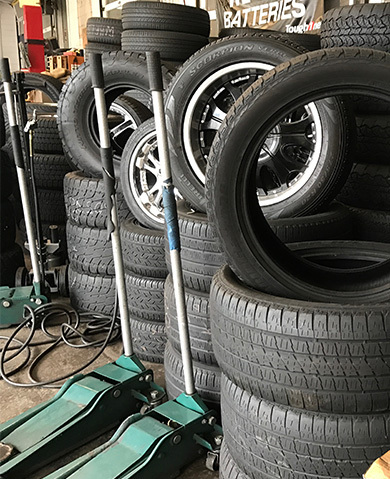 Are you searching for new or used 18, 20, 22, 24 or 26 inch rims, wheels and tires in New Orleans, LA? You’ve found the right spot. Uncle Sam Auto Repair also have a huge selection of wheels and tires. We make it easy for you to find the right wheel and tire package at the right price. Have scuffed rims or dent wheels? We can fix that too! We have plenty of customers who look to us for safe affordable tires for their car or truck. Installation is always FREE! For all the latest tires and wheels visit our showroom today! NO CREDIT, NO PROBLEM - Finance your wheels today! What bolt pattern do I have? The bolt pattern represents an imaginary circle going through the center of the wheel lugs. The most common bolt patterns in the industry are 4, 5, 6 or 8 lug holes. As an example, a 5x114.3 bolt pattern represents a 5 lug pattern on a 114.3 mm diameter circle. How do I measure the offset? Most after-market wheels are made with a larger hub to ensure that they will fit on a wide range of vehicles. This means that when the wheel is installed, there will most likely be a space between the axle and the hub instead of a firm contact. The wheel is therefore lug-centric, as the wheel is centered by the lugs rather than by the hub. In the case of steel rims, we cannot put centering rings! There is no danger with putting on these rims. Most vehicles on the road will have these lug centric rims since they are more popular with garages. They only have to stock a small amount compared to a hub centric wheel. With the several different finishes now available on the market, you will have to decide if you want to install colorful wheels or a more classic finish like silver or black. On modern cars from the past decade, the black machined two tone finish is very popular and there is a great selection of after-market wheels with that specific finish. Selecting the correct wheel color will greatly depend on the vehicle’s color. You might be looking for a tone on tone look, for a classic silver finish or for a more subtle all black finish.